The Woodsmen Quartet would like to welcome on board their brand new tenor, Tony Jarman! 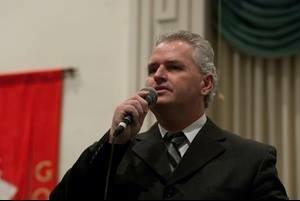 Tony is absolutely no stranger to Southern Gospel Music as he has sung with some of the biggest names in the business! Some of the groups he has sung with are The Old Time Gospel Hour Quartet, Phil Cross & The Poet Voices, the Down East Boys, and Legacy Five! You may recognize his amazing and unique voice on Legacy Five classics such as, “He’s Been There”, “Little is Much”, “I Found Grace”, and many more! You may also recognize him on a very familiar Down East Boys/Old Time Gospel Hour Quartet song, “I Won’t Trade My Crown.” Tony has sung in thousands of places all across the world and has been ministering and sharing the Gospel of Jesus Christ for decades! Tony is also no stranger to the Woodsmen Quartet! Having filled in for Daniel Rivera on select weekends, Tony has gotten to know the guys on and off the bus and has already fit in and become apart of the Woodsmen family! “As soon as I told Tim I was going to be leaving, Tony was the first name that came out of my mouth. Now did my opinion really matter? Not really lol but if I had the chance to have Tony Jarman in my group, I’d take it.” stated Daniel Rivera, departing tenor of the Woodsmen. Tony’s voice, spirit passion, and heart for our Saviour will make his way right into yours! Tony’s first official date with the Woodsmen on October 31, 2015 at the Francisco General Baptist Church in Francisco, IN at 6pm! welcome Mr. Tony Jarman to the Woodsmen Quartet!